Negril, Jamaica's homemade car rental, the Island Cruiser will be your vehicle rental in Jamaica. Available hard and soft top, our jeeps will allow to tour Jamaica's beauty in comfort! Happy World Car & Bike Rentals is located on Norman Manley Beach Road, Negril Westmoreland. Visit us for all your rental needs. 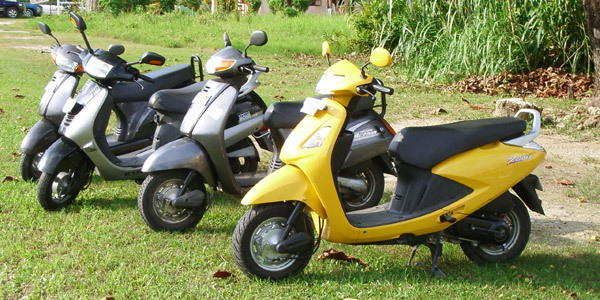 Our fleet of vehicles include scooters, cars and jeeps. Let us take care of your transportation while you enjoy your Negril vacation. Explore Jamaica in a convertible 4WD Jeep! Tour off highway and visit Jamaica's countryside. Climb secondary roads with ease and reach that mountain summit, where the splender of a West Coast sunset, lights up the sky for miles. Hello, and welcome to Gilpin Bike Rentals webpage, home of Negril's finest scooters. We have invested in all new Honda scooters capable of handeling two people to safley cruise around the newly remodeled streets of Negril. Warning! Do not use Prento Bike Rental. There have been many reports of mal practice. Including myself!